PLYMOUTH Diving enjoyed plenty of success over the weekend. In North America, Matthew Dixon produced an eye-catching performance at the USA leg of the FINA Grand Prix in Mission Viejo. Dixon, who turns 19 this week, took silver in the men’s platform event with an impressive 471.10 points. He was only beaten by Mexico’s Randall Willars Valdez, who scored 479.55 points. Those two were nearly 30 points ahead of anyone else in the final. The Plymouth diver averaged nearly 79 points for his six dives in the final and he would have been particularly pleased with the 94.35 points he scored for his new 109C forward four-and-a-half somersault tuck. It was Dixon’s second individual medal in seven days having won bronze at the Canada Cup FINA Grand Prix in Calgary. In Canada, Dixon had also added a mixed three-metre synchro silver medal to his collection with Scarlett Mew-Jensen. However, the pair could not repeat that in Mission Viejo and has to settle for fifth spot. 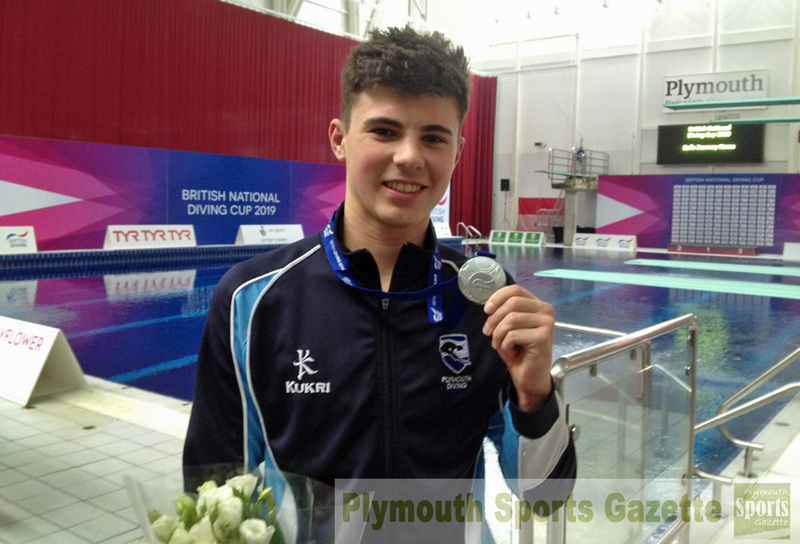 Meanwhile, closer to home, Plymouth Diving returned with a host of medals from the British Elite Junior Championships in Sheffield. Commonwealth Games athlete Aidan Heslop returned to Devon with a medal of every colour. Competing in the boys’ A category, he won a three-metre synchro gold with Leeds’ Oliver Crompton, he claimed an individual platform silver behind fellow Commonwealth Games athlete Lucas Thomson and won a bronze in the three-metre event. In the boys’ B section, Plymouth team-mate Euan McCabe also came away with three medals. He won gold in the platform competition and took bronzes in the three-metre individual and synchro competition with Sheffield’s Harrison Hartley. In the nine to 13-year-olds’ synchro competition, Zachery Anderson won gold with Southend’s Todd Geggus. Anderson also won an individual silver medal in the boys’ C three-metre event. There was a gold for Cody Powell-Tuckett in the girls’ A platform. She enjoyed a great battle with Crystal Palace’s Jose Zillig and just 0.50 of a point separated them at the end. Tommy Davis, Summer Radcliffe, Alfie Brown, Connor West, Frances Burdett, Katie Martin, Josh Gibbs and Josh Freeman also competed at the top junior domestic event.